QUESTION: Can I still use "Instant" booking? QUESTION: How do I know if I'm booking the 2BR or 4BR option? ANSWER: Our rates are based on the typical space desired by our Guests, based on the time of year. See below. QUESTION: What if I want to book the 4BR option outside of those two special times per year? ANSWER: Please e-mail Owner for special rate quote by clicking on "Ask Owner a Question". QUESTION: How does the "Flex" space option work? ANSWER: We have a lockable INTERIOR door between the Main Level and Lower Level. If you book the 2BR, the door is locked; if you book the 4BR, the door is unlocked. QUESTION: If I book the 2BR option, will there be other guests in the Lower Level? ANSWER: No, we do not rent the Lower Level separately. You will have access to the Main Level only. We want you to have complete privacy and serenity during your stay with us. Lakewood Lodge overlooks Lake Glenville, a 1,500-acre pristine lake in western North Carolina’s Blue Ridge Mountains in the heart of the Nantahala National Forest. We are surrounded with an abundance of local activities such as Fishing, Hiking, Snowboarding and Whitewater Rafting. Or venture to nearby attractions such as the Biltmore Estate in Asheville, or Harrah's Casino and the Cherokee Indian Reservation in Cherokee, NC. The nearby communities of Cashiers, NC and Highlands, NC offer a vast array of renowned gourmet restaurants and quaint shops for browsing. * Spring is ideal for whitewater rafting and kayaking enthusiasts. * Summers offer on-site boat rentals, water skiing, jet skiing, canoeing, and pampering massage services. * Autumn is the perfect time for hiking and nature walks in the cool crisp mountains. * Enjoy winter at its best - skiing, snowboarding and snow tubing for all levels at nearby trails. Year-round you can play tennis on indoor or outdoor clay courts, and enjoy fishing, hiking and local live theater. Play golf on a four-star private course from Spring through Fall. Enjoy the many private Club amenities of Trillium Links & Lake Club such as Golf, Tennis, Dining or the 25,000 square ft. fitness center complex (referred to as Apple Orchard Park). All of the private Club privileges at the Trillium Links & Lake Club are available to you at a nominal cost. The Trillium Amenity fees are paid directly to Trillium upon arrival. Pre-registration is required. Please indicate that you wish to take advantage of the amenities and we'll call you for additional details. During the winter months (Dec-Mar), the only amenity open is the 25,000 sq. ft. Fitness Center. To use the facility an amenity fee of $10/day or $50/week is charged. This includes all members of your party; there is no additional fee per person. The Trillium Amenity fees for the rest of the year are based on your length of stay. Again, the rates below are for ALL members of your party. No additional fees per person are required. NOTE: All Trillium Amenity fees are subject to change by Trillium Club management. We live in Atlanta and take advantage of every opportunity to come up to our beloved Lakewood Lodge. Our home is typically booked half of the year, most often by repeat guests. In fact, we've become friends with many of our guests who've stayed with us for many years. Doug is a licensed Psychotherapist and is now semi-retired. He works at an Intensive Outpatient facility in nearby Roswell, GA and also does ad hoc training and curricula development. His hobbies include playing guitar and all outdoor activities. Jo is a Private Banker and works for a regional bank in the Private Wealth Management area. She enjoys working out (yes, at the gym), church ministries and reading. It was truly "love at first sight'" the first time we drove through this area on a trip. The natural beauty was awe-inspiring, and we vowed then to live in this "heaven on earth" someday. After receiving the Grand Opening announcement from Trillium in 1997, we jumped on the chance to come up. We were impressed with the award-winning community design, the extensive Trillium amenities and the integrity of the developer. Our lot was specifically selected due to its awesome year-round lake views and the privacy afforded by the private island opposite our lot. We built our home high on the lot to best take advantage of the lake and mountain views. We love the feeling of being in a tree house when we sit on the decks. Our custom home was designed especially with rental guests and our friends & family in mind. The bedrooms all have their own baths and are separated from each other for privacy. The Lover Level is an independent "suite'"of rooms, complete with full Kitchen, Living, Dining and two Bedrooms. This allows us to have guests and our own privacy too - the best of both worlds! The furnishings were selected with the help of a local designer and construction was completed in 2002. We've enjoyed our many rental guests over the years. Please see the entire Guest Comments listing on our website and you'll see why. 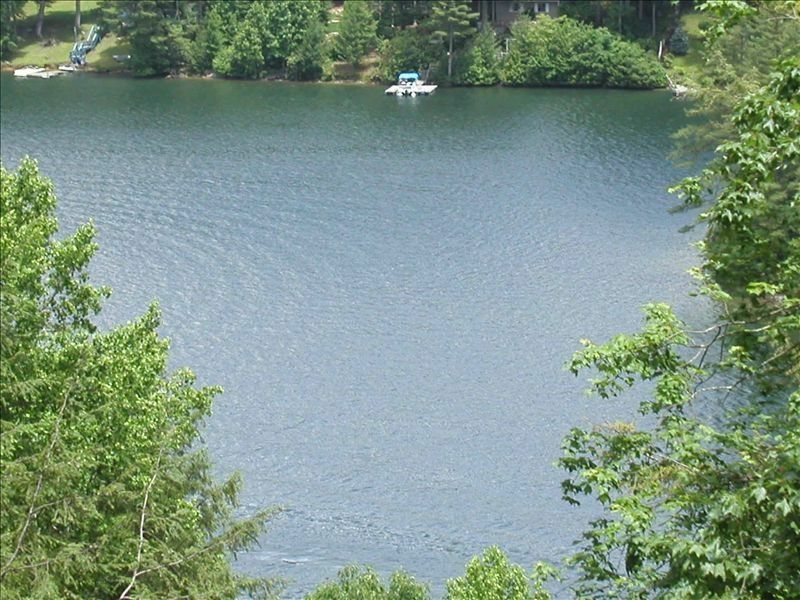 We love the local Cashiers area outdoor activities such as hiking Whiteside Mountain or the many waterfall trails and, of course, paddling on Lake Glenville. The fabulous Trillium Fitness Center is used almost every day we're up here. The views are much lovelier than our gym at home! We particularly enjoy sharing our wonderful home with family and friends. Our grown children love the amenities so much, especially the Golf & Fishing, that they jump at every chance to come up. Our little grandson likes the nature trails in the neighborhood. Our children also like the privacy of having the Lower Level all to themselves. We almost always entertain our out-of-town guests here. The vast array of amenities and things to do is delightful for any guest. And we like the privacy of having our own 'space' in the Main Level. ~~~~~~~~~~~~~~~~~~~~~~~~~~~~~~~~~~~~~~~~~~~~~~~~~~~~~~~ The Main Level Master Bath features an Ultra Hot Air Tub offering the latest innovations for a sanitary, jet-spa experience. It also offers a separate shower, water closet, double vanity sinks and plenty of cabinet storage..
Central air with separate HVAC units/controls for each level. Central heat with separate HVAC units/controls for each level. Separate full size washer on each level. Separate full size dryer on each level. All towels are provided for Bath, Kitchen, Pool and Golf. Trillium amenities include the 25,000 sq. ft. Apple Orchard Park indoor tennis and fitness center. See our website for details (www.LakewoodLodgeNC.com). Open concept living area provides plenty of seating. Each level has an extra quiet dishwasher so they won't spoil your peaceful time in the mountains. Main Level kitchen features side-by-side refrigerator with ice/water dispenser in door. Lower Level kitchen has top-mount freezer with icemaker. Main Level kitchen features ceramic cooking top with convection oven. Lower Level kitchen has ceramic cooking top with standard electric oven. Each level has a microwave/vent hood over the stove. Main Level kitchen features a combination coffee/tea maker. Lower level kitchen has a coffee maker with carafe. Also a grinder with limited quantity of coffee beans, assorted teas, creamers, sugars. We provide a wide selection of staples such as sugar, flour, oils, vinegars, baking items, numerous spices and much more. Paper products, soaps, shampoo/conditioner are also supplied. Main Level kitchen has 12 place settings, both glass & plastic beverage glasses, complete bar ware and more. Lower Level kitchen has 8 place settings. A great feature for larger groups! (2) separate full kitchens with standard size appliances on each level. Main Level dining seats 7 & has 4 kitchen bar stools for additional seating. Lower Level dining seats 4. Highchair & booster seat available at additional cost. Each Living area has a TV with separate Bose speakers and connected DVD/CD player. Main Level Master Bedroom also has a TV with DVD player. 3 separate receivers for each TV so you can watch different programs at the same time. Main Level living satellite has DVR so you can record programs. Receiver connects TV, DVD/CD player and Bose speakers. Dozens of hardback and paperback books for adults. A limited number of children's books. Air Hockey, Ping Pong Table, (2) large screen TV's (one with WII system). Shared Trillium amenity open Memorial Day through Labor Day. A short walk away. Board games, cards, dice, dominoes and more for all ages. DirecTV Satellite TV features numerous Music channels. Shared Trillium amenity open Memorial Day through Labor Day. Located a short walk away near the Landings Restaurant and Trillium boat dock. Over 50 DVDs for all ages. WII system. Shared Trillium amenity open Memorial Day through Labor Day. Located a short walk away near the Landings Restaurant and Trillium boat dock. Great lake viewing area on the covered deck on each level. Connects the outdoor Dining and Lounge areas. Kayaks, canoes, paddles and life jackets are available. Boarding is from Trillium’s own docks, a short walk from Lakewood Lodge. A 600 sq. ft. covered deck on each level. Each deck includes a luxuriously furnished outdoor Dining area and Lounge area to enjoy in any season. Each Lounge area includes a porch swing, end tables and 2 comfortable gliders. Beach/Pool Towels and swim boards provided at Lakewood Lodge. Only 15 minutes away from one of the area’s favorite winter sports venues, Sapphire Valley Ski Resort. See our website for details (www.LakewoodLodgeNC.com). Play year round on 5 beautifully maintained HAR-TRU® clay courts. 2 outdoor courts and 3 indoor courts. Ball machine, racquet rentals, coaching and lessons are available. The private Trillium Links offers a comprehensive range of golfing amenities unlike any other in the mountains of North Carolina: Driving Range, Practice Facility, and an Award-Winning Course. A few steps lead up to the Main Level but otherwise ideal for mildly handicapped or seniors. Two indoor saunas are located in the men's and ladies locker rooms at Trillium's 25,000 sq. ft. Apple Orchard Park indoor tennis and fitness center. Trillium Club amenity, located close to the Clubhouse. Includes a heated pool and Jacuzzi whirlpool. Our Free “Vacation Office” package allows you to get away even longer than you thought! This includes: ultra high speed wireless DSL internet, caller ID/call waiting, 4 land-line telephones, unlimited local & long distance calls, and 3-way conference calling. ~~~~~~~~~~~~~~~~~~~~~~~~~~~~~~~~~~~~~~~~~~ An Optional “Infant & Toddler” Package includes: Infant seat, High chair, Booster seat, Top of stairs safety gate, Safety electrical outlet plugs, Infant/toddler dishes, etc. Our family of six spent a wonderful Christmas holiday in this beautiful home on Lake Glenville. The view was very nice (lake and mountains) and the accommodations were great. Beds were comfortable and the home was well equipped with everything we needed. The floorpan is ideal for larger families or two couples as each floor has two bedrooms, kitchen and deck access. We want to come back in the summer to experience the lake activities. You can't go wrong with this home! This meticulously cared for home is so welcoming and the setting is beautiful. Our family enjoyed this 5 star residence for our Thanksgiving celebration. We loved the local hikes, early morning and afternoon respites on the decks and playing games near the fireplace. Great getaway. This was a great get away for all four couples!!! It was like a home away from home with everything you could possibly need or want right at hand!! The view was amazing and the weather perfect!!! It couldn’t have been any better!! Beautiful house with beautiful views of the lake. This was the second time we've stayed at Lakewood Lodge, and it definitely won't be our last! We loved sitting outside on the porch every morning enjoying coffee The weather was perfect, and the view of the lake is beautiful! Lakewood Lodge is so quiet, peaceful, and heavenly! We loved staying here and would highly recommend it to other families! Other Activities: There are so many activities for every age that you'll run out of time to enjoy them all. * Golf (18-Hole and 9-Hole Chip & Putt Courses) * Tennis (Indoor & Outdoor Clay Courts) * Fishing (Fly Fishing & Lake Fishing) * Water Fun (Boating, Water Skiing, Jet Skiing, Pool) * Paddling (Kayaking, Canoeing, Whitewater Rafting) * Outdoors (Hiking, Croquet, Horseback Riding, Gem Mining) * Winter Fun (Skiing, Snowbording & Snow Tubing) * Fitness/Spa (25,000 sq. ft. Center, Massages, Saunas) * Dining (3 Onsite Venues and Local Restaurants) * Shopping (Cashiers & Highlands) * Cultural Activities (Theaters, Music & Arts Festivals) * Day Trips (Biltmore Estate, Harrah's Casino, etc. Golf: Truly a golfer’s paradise! We have playing opportunities for every age and skill level. Our experienced PGA Pro staff offers group and private lessons throughout the season. Our award-winning Trillium Links 18-hole Championship Course was created by course designer and PGA Senior Tour player Morris Hatalsky. With bent grass tees, greens and fairways, and 4 sets of tees, you'll find golf here challenging and enjoyable regardless of your handicap. Trillium Garden Golf is a whimsical 9-hole Garden Golf course for every family member to stroll, chip and putt, free of tee times. Brush up on your short game or teach your kids about the game. You’ll find wedges and putters, balls and score cards at Lakewood Lodge. Ski: Lakewood Lodge is only 15 minutes away from one of the area’s favorite winter sports venues. Nearby Sapphire Valley Ski Resort provides affordable fun for the entire family. Skiers and Snowboarders will enjoy either of two runs, one each for Intermediate and Beginners. The “Sapphire Streamliner” run is 1,600 feet with a 200 foot vertical drop. Lift lines are brief so you enjoy more downhill action. Frozen Falls Tube Park offers a 500 foot snow tube hill with a 60 foot vertical drop. It's a thrilling adventure for all ages to enjoy. Even your little ones will have a ball. There’s a rope tow to the top and park attendants help ensure a safe outing for your family. Skis, Poles, Snowboards, Helmets and Boots are available for rent. Group and Private Lessons are offered.